You know what’s a great way to spend a crisp, mid-October weekend? Driving through the mountains, enjoying the changing fall leaves, and maybe stopping by a quaint roadside stand for some hot cider. If you are down in the Ozarks, why not stop by the Midwest AAOE Fall Meeting? 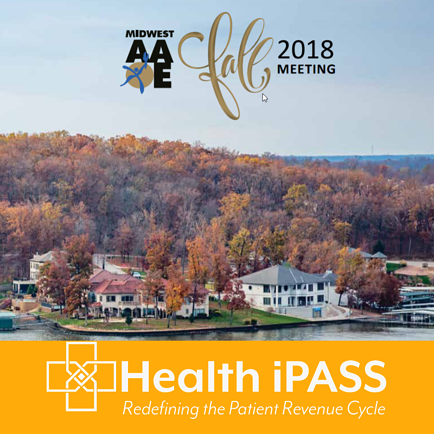 Health iPASS will be there, sharing our patient revenue cycle solution with providers looking to optimize patient payments, boost patient engagement, and provide greater price transparency. As 2018 draws to a close, elective procedure season is on the horizon, when patients are finally prepared to go through with the surgeries and treatments they had been putting off. Some of the spike in elective procedures can be attributed to the seasons themselves, and others just become more feasible to patients due to financial incentives such as using up money left in HSA or FSA accounts, or hitting their yearly deductible. Orthopedic procedures such as joint replacement and treatments such as physical therapy see a particular uptick in the final three months of the year. As more patients come to your practice with requests for higher-dollar services, isn’t it time to make sure your patient revenue cycle is running smoothly? Imagine patients entering your office having already completed all of the pertinent Consent to Treat, HIPAA, and other forms online or via their smartphone. (Yup, you heard that right—Health iPASS now offers forms management—sweet!) Instead of standing in line, waiting for that pen and clipboard, they are greeted by a convenient iPad-based kiosk where they can quickly check in, verify or change demographic information, and make payments on co-pays, prior balances, and pre-service deposits. After their office visit, they can view cost-estimates for what they may owe after insurance adjudication and leave a card on file for payment of any residual balances, saving them time and hassle, and providing you payment assurance. Does that sound like a more efficient and optimized patient revenue cycle than your current process? If so, come visit Greg at Midwest AAOE to see a demo of the Health iPASS patient RCM solution. If streamlining patient payments, boosting patient engagement and retention, and providing soon-to-be-mandated price transparency isn’t enough incentive for you, remember that for every demo scheduled during the 2018 conference schedule, Health iPASS will make a donation to the Chicago Food Depository, and that you can drop off your business card to win an Amazon Echo. Also, I hear the dinner cruise on the lake is not to be missed. For real, what’s not to like? Hope to see you there at Midwest AAOE this weekend in Lake Ozark, MO!